Asteroids are metallic, rocky bodies without atmospheres that orbit the Sun but are too small to be classified as planets. Known as "minor planets," tens of thousands of asteroids congregate in the so-called main asteroid belt: a vast, doughnut-shaped ring located between the orbits of Mars and Jupiter from approximately 2 to 4 AU (186 million to 370 million miles/300 million to 600 million kilometers). 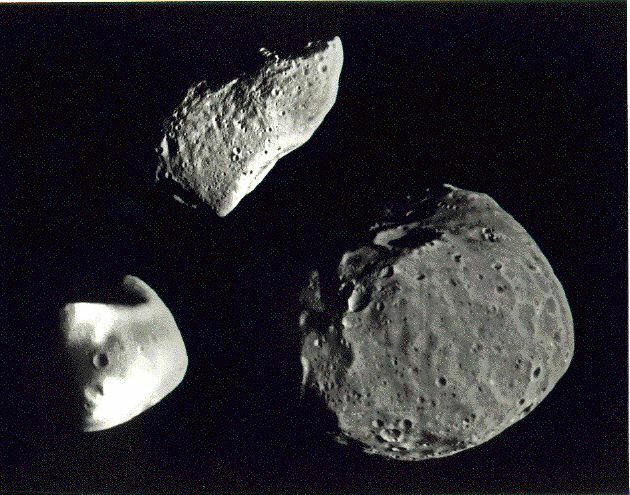 Gaspra and Ida are main belt asteroids. Asteroids are thought to be primordial material prevented by Jupiter's strong gravity from accreting into a planet-sized body when the solar system was born 4.6 billion years ago. It is estimated that the total mass of all asteroids would comprise a body approximately 930 miles (1,500 kilometers) in diameter -- less than half the size of the Moon. Known asteroids range in size from the largest -- Ceres, the first discovered asteroid in 1801 -- at about 600 miles (1,000 kilometers) in diameter down to the size of pebbles. 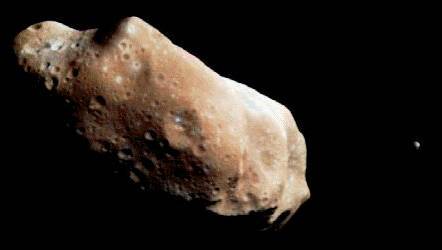 Sixteen asteroids have diameters of 150 miles (240 kilometers) or greater. The majority of main belt asteroids follow slightly elliptical, stable orbits, revolving in the same direction as the Earth and taking from three to six years to complete a full circuit of the Sun. Our understanding of asteroids has been derived from three main sources: Earth-based remote sensing, data from the Galileo flybys, and laboratory analysis of meteorites. 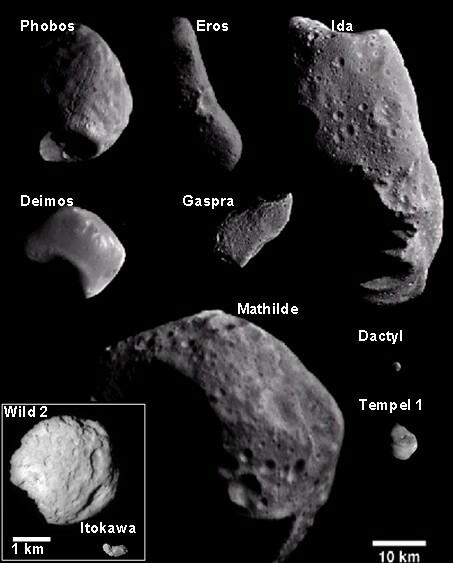 Asteroids are classified into different types according to their albedo, composition derived from spectral features in their reflected sunlight, and inferred similarities to known meteorite types. Albedo refers to an object's measure of reflectivity, or intrinsic brightness. A white, perfectly reflecting surface has an albedo of 1.0; a black, perfectly absorbing surface has an albedo of 0.0. C-type (carbonaceous): Includes more than 75 percent of known asteroids. Very dark with an albedo of 0.03-0.09. Composition is thought to be similar to the Sun, depleted in hydrogen, helium, and other volatiles. C-type asteroids inhabit the main belt's outer regions. 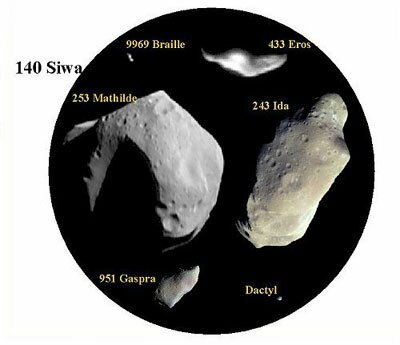 S-type (silicaceous): Accounts for about 17 percent of known asteroids. Relatively bright with an albedo of 0.10-0.22. Composition is metallic iron mixed with iron- and magnesium-silicates. S-type asteroids dominate the inner asteroid belt. M-type (metallic): Includes many of the rest of the known asteroids. Relatively bright with an albedo of 0.10- 0.18. Composition is apparently dominated by metallic iron. M-type asteroids inhabit the main belt's middle region. The relationship between asteroids and meteorites remains a puzzle. The most common meteorites, known as ordinary chondrites, are composed of small grains of rock and appear to be relatively unchanged since the solar system formed. Stony-iron meteorites, on the other hand, appear to be remnants of larger bodies that were once melted so that the heavier metals and lighter rocks separated into different layers. A long-standing scientific debate exists over whether the most common asteroids -- the S-types -- are the source of ordinary chondrites. Spectral evidence so far suggests that the S-type asteroids may be geochemically processed bodies akin to the stony-irons. If S-types are unrelated to ordinary chondrites, then another parent source must be found. If the two are related, then scientists need an explanation for why they aren't spectrally similar. Asteroids with orbits that bring them within 1.3 AU (121 million miles/195 million kilometers) of the Sun are known as Earth-approaching or near-Earth asteroids (NEAs). It is believed that most NEAs are fragments jarred from the main belt by a combination of asteroid collisions and the gravitational influence of Jupiter. Some NEAs may be the nuclei of dead, short-period comets. The NEA population appears to be representative of most or all asteroid types found in the main belt. NEAs are grouped into three categories, named for famous members of each: 1221 Amor, 1862 Apollo, and 2062 Aten. 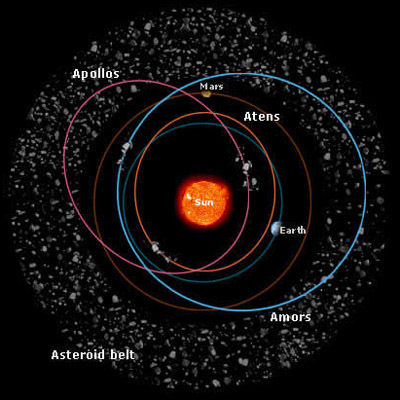 Amors: Asteroids which cross Mars' orbit but do not quite reach the orbit of Earth. Eros -- target of the NEAR mission -- is a typical Amor. Apollos: Asteroids which cross Earth's orbit with a period greater than 1 year. Geographos represents the Apollos. Atens: Asteroids which cross Earth's orbit with a period less than 1 year. Ra-Shalom is a typical Aten. NEAs are a dynamically young population whose orbits evolve on 100-million-year time scales because of collisions and gravitational interactions with the Sun and the terrestrial planets. Approximately 250 NEAs have been found to date, probably only a few percent of their total population. The largest presently known is 1036 Ganymed, with an approximate diameter of 25.5 miles (41 kilometers). Estimates suggest at least a thousand NEAs may be large enough -- 0.6 mile (1 kilometer) or more in diameter -- to threaten Earth. Many bodies have struck Earth and the Moon in the past, and one widely accepted theory blames the impact 65 million years ago of an asteroid or comet at least 6 miles (10 kilometers) in diameter for mass extinctions among many lifeforms, including the dinosaurs. Other theories suggest that the chemical building blocks of life and much of Earth's water arrived on asteroids or comets that bombarded the planet in its youth. On June 30, 1908, a small asteroid 330 feet (100 meters) in diameter exploded over the remote region of Tunguska in Siberia, devastating more than half a million acres of forest. NASA's Jet Propulsion Laboratory is introducing a new Web site that will provide a centralized resource for information on near-Earth objects - those asteroids and comets that can approach Earth. The B612 is a non-profit organization founded by a group of astronauts and scientists whose goal is to predict and prevent catastrophic asteroid impacts on Earth. B612 aims to find potentially threatening asteroids, track their trajectories, and to demonstrate the technology to alter the orbit of an asteroid in a controlled manner.